I recently shared this on one of my social media pages (Twitter). However, I decided to share it here to inspire more people since not all CDI's readers follow us on social media. I hope you get inspired. ENJOY! You might be saying to yourself ''no one has as many insecurities as I do. My insecurities are uncountable that the entire world could see them''. One thing about insecurities is that they only become noticeable by others the moment you mention it to them. Everyone has one insecurity or the other. Some were born with theirs, some grew up struggling with theirs while others started having theirs later on in their lives. no one and just work on yourself one step at a time because the moment you do, they will use it against you. Some insecurities can be obvious while some, you need to tell people if they can know them. But work on yourself rather than tell others about your them. You might be saying inside of you, "but why? I can't die with these insecurities. It is a struggle to live with them". Your insecurities are more or less your weak point or your weaknesses. You might end up telling the wrong person /people what they are. And BOOM! They now have some sort of power over you. They now have the power to control your emotions. Because when they use it against you, you might end up feeling down for the rest of the day or week or month etc. That's why it is very important to FIGHT! FIGHT your insecurities one after the other. Work on them in such a way that they become non-existence. But how you may ask? Fall madly in love with yourself. By this, as you work to improve yourself, you will understand that you are not working on yourself because you hate some part of you but because you love yourself enough to improve yourself. This will boost your self esteem & self confidence by 100%. So that when people decide to hate on you because of your insecurities or talk bad to you/about you because of these insecurities you will just smile as though they never said or did anything. Keep building, developing and improving yourself. With this, everyday, you become better than the person they knew yesterday. 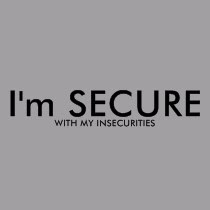 Interesting read.work on your insecurities mmhh nice! !